Coyotes is the true story of a journalist, Ted Conover, who spent a year living the life of an illegal immigrant. On his quest to tell their stories, he meets and befriends a variety of people that agree to take him across the border with them. The story is divided into several sections, each with a different setting and new group of people. A lot is packed into this short book, so bear with me, because there is not much I can gloss over to explain it more succinctly. In the first section, Conover makes a border crossing in Nuevo Laredo with his initial traveling partner, Alonso, who he met in Mexico City. They negotiate a crossing with a coyote (the human smuggler type, not the animal) and raft successfully across the Rio Grande. Conover decides to travel to Houston with Alonso to find work, but on the bus trip, Immigration does an inspection and Alonso is found out and deported, just one day after arriving in the U.S. The story then jumps from Nuevo Laredo to Phoenix, where the author spends time working at a citrus grove amongst undocumented workers, learning how difficult the work really is and how little a person makes at it. When the citrus season is over, he decides to follow his newfound friends to L.A., where they are going to live with family. After pooling their resources and buying a $300 car that gives out before they get 50 miles, the author offers to navigate his friends through the complexities of air travel. Their flight from Phoenix to L.A. is a nail-biter, as Conover and four illegal immigrants go through airport security and encounter such unexpected problems as unfamiliarity with the use of an escalator. He also encounters prejudices from his white counterparts in society, even getting beaten up at one point in an all-night coffee shop the first night he and his friends arrive in L.A.
After L.A., the story jumps back to Phoenix, where Conover meets up with a group from his initial citrus grove which is traveling to Florida to work in the orange groves there. After a failed attempt to acquire a coyote to transport them, the group purchases a junky used car and drives there, navigating purely from memory, Conover finds, since none of them can read a map. After spending so much time with his new friends, the author decides to find out the other part of the story—what they left behind in Mexico. The next section of the book details his four months spent in Ahuacatlán, Mexico, a place the priest there refers to as “a parish of widows and orphans”—all the men have gone to work up north. During his stay, you get a glimpse of life in this town, where life is more simple and more humble, but people are still happy. And yet, the lure of making quick money draws almost all the men in their 20’s and 30’s away, depleting the community. It is at the end of his stay in Ahuacatlán that Conover decides to join his friends on a trek north to cross the border another time, traveling by bus through Mexico, and again faced with negotiating the services of a coyote. This time the group is large—17 people, and by now Conover is so immersed in the culture that the coyotes don’t even realize he isn’t Mexican, despite his blonde hair and blue eyes. On their way to the crossing, the coyotes are pulled over by judiciales—Mexican police. The group is taken in for questioning and several of them are tortured by the police. When they get to Conover he is forced to admit, in fear for his life, that he is American. After inspecting his documentation they tell him he can go. They take money from the rest of the group and leave them, at which point Conover, who has been hiding since his release, rejoins his friends. This time they decide to walk across the border without a coyote’s help. They walk 35 miles across the desert of Arizona until they reach an Indian reservation where they are assisted in making the rest of the journey to Phoenix. They decide to continue north to Idaho to pick potatoes, and as they are driving, they are pulled over. Again, even the police don’t realize Conover is not an illegal alien until the group is in jail. He is released, but his friends are deported so he flies back to Phoenix. He later says that his friends were back in Phoenix within four days. This book both humanizes the plight of illegal immigrants and highlights the futility of the U.S. attempt to stop the flow of people entering the country. The research for this book was done in the mid-eighties, but it feels as though not much has changed since then in the reasons for or methods used in illegal immigration. The story was interesting, but also draining. 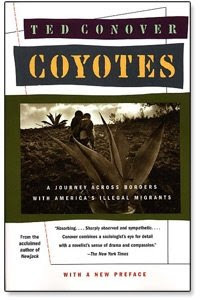 Conover’s actions in traveling with the undocumented workers are illegal, and the story has the reader nervous at times, as he treads a fine line between danger at the hands of unscrupulous coyotes who are reluctant to bring along a white guy, even in the company of his Mexican friends, and the U.S. law enforcement, who could bring felony charges against him if he is caught traveling with illegal aliens. The story often feels disjointed, as the author moves from location to location without much explanation as to when or why. At points you feel almost like some crazy friend of yours is telling you a story instead of feeling that you are reading a serious commentary on the immigration plight. The story feels like it has been told once you reach the midpoint of the book, but Conover continues his quest until it seems that he doesn’t want to re-assimilate to “normal” society. It seems as though he has become one of them, and he is reluctant to leave his friends behind. It was an interesting read. Sounds like he lived a very insane life for awhile, and apparently got fairly attached to it. Yeah, it become more of a story of his acceptance by and integration into another group of people, which I don't think was his intention. Occasionally, it's as if he realizes he needs to snap back to the main point, and that is that he can easily leave this scenario, but they cannot.